Updating the Active Directory schema is an irreversible operation – therefore I need a test environment which is completely isolated from production to test all affected applications/virtual machines. One requirement is to keep the IP settings of the test candidates, a second one that it should be very easy to clone virtual machines from production to test. There are several ways/designs to fulfill these requirements – I decided to use the following one, as it was very easy to put into operation without investing a lot of time and hardware. The entire test environment is running on one single VMware ESXi host, equipped with sufficient RAM and local disks. The ESXi host has access to a dedicated LUN on the shared storage to exchange virtual machines easily. To ensure that the virtual machines of the test environment have no network access to production, I configured the vSwitch for the VMs without a physical adapter. The second vSwitch has a connection to the network (management traffic and vMotion is enabled). So you can access the virtual machines via console of the webclient/vSphere Client and clone them from production to test. As the vSwitch for the VMs has no connection to a physical network switch, you need a solution for network traffic routing. 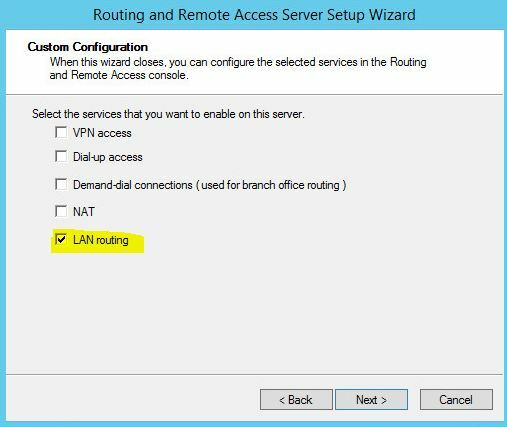 I use a windows virtual machine (Server 2012 R2) with activated LAN Routing. This vSwitch uses a physical NIC to access the company’s network. 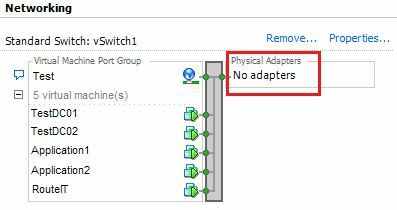 No physical adapters are configured for this vSwitch. This ensures that no traffic from the test environment find its way into production. Two datastores are configured with local discs to host the virtual machines. Additionally the host has access to a LUN on the company’s shared storage system to exchange virtual machines between these two worlds. As the virtual machines have no connect to a physical router and as the vSwitch has no routing function, we need a possiblity to route the network traffic between the different VLANs of the virtual machines. If you want, you can use a virtual router (e.g. pfSense) for this. 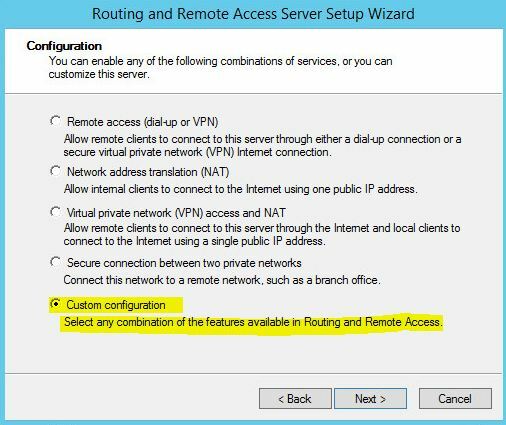 I decided to use a Server 2012 R2 VM with active LAN Routing to take this role. If you want to use a windows server as virtual router, just add one network adapter for each VLAN to the VM. When you have configured a dedicated NIC for each needed VLAN, open a MMC and add the following Snap-in: Routing and Remote Access. Select the VM, click “clone”, define a name and select the test host as target. You can ignore the compatibility warning, that the network adapter uses a network which is not accessible. You can adapt this after cloning is completed. After selecting a destination storage, the wizzard asks you if you want to customize the guest operating system. Select “Do not customize” when you need an identical virtual machine for your tests! With “Finish” you can start the process. 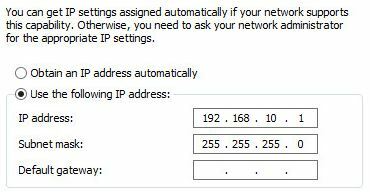 When cloning is completed take a look at the network adapter settings (eg. Network label,…). If everything is configured as wanted you can start the VM and test network routing. Hi any chance you can put something up about how to do this with pfsense? I also would love to see how to do this with Pfsense. Great post. The only issue I see with this is more on the application side. We run into the issue where our production network is approximately 60 Servers. with this many servers and clones, we run into replication issues and domain drops due to sync issues of the replicated domain. Any Idea of the best way to do this with either Veeam or vsphere replicaiton? I was thinking restore from backup at a point time but there is no way to get the exact same time for all those servers. Maybe Vsphere replication is the better solution? I had follow your setup, but in certain point I need connection from isolated private network (192.168.0.0/24) to the physical ESXi host. That is of course not working as an ESXi host has its vmk0 in totally different subnet (e.g. 182.30.x.x). Is there any way how to make it working (it means connection from VM placed in 192.168.0.0/24 to ESXi in 182.30.x.x. )?